Want to share this page with your friends? You’ve made the commitment. Now your story can begin to tell itself. Dinner doesn’t have to be a fancy event with an exotic recipe. It can be simple and relaxed. What is the simplest and most loved meal in your home? Cook it and have dinner together again this week, and find a way to make family dinner easier for everyone involved. Here’s how: Take something that’s working well, and do more of it. Then, take something else that isn’t working as well, and — you guessed it — do less of that. Have a conversation and decide on one thing that went well last week. Looking at your Goal Sheet may help you see where you made progress and help you identify one thing that is getting in the way. Maybe planning the menus together satisfied the picky eaters. If so, planning conversation topics or games together might work for you, too. Then, think about something that didn’t work as well. Maybe it was hard to get everyone to make it to the table on time. 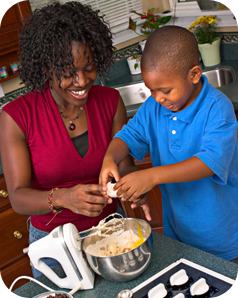 Can you vary dinnertime to accommodate different schedules? Or can you plan a family breakfast or night-time snack? You might not be able to change all the things that get in the way, but we have some ideas to help you work around almost any challenge you might have. What’s working well at dinnertime? How can we do more of that? What isn’t working for us? How can we do less of that, or get around it? How can we get everybody involved so that one person isn’t doing all the work? As you think about changes, remember that the goal for this week is to keep it simple. Don’t be tempted to revise everything all at once, just make two meaningful changes and stop right there. Simple, relaxed, not perfect. You can even ease up on manners and behavior a little. Just let people do their best. You might discover that it’s good enough. CELEBRATE! There’s at least one thing that’s going well, and this week, you got even better at that. Accentuate the positive! As far as the part that isn’t going well, you’re working on it. Letting go of perfect might be the most important lesson your family takes away from this week.